The shrine of the Orang Cayen of Constansia, though the most prominent, are not the only graves of Auliyah to be found. 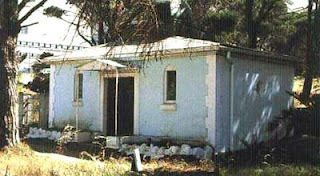 In 1972 another grave was found. The grave was identified by woodcutters working in Constantia. Strange things happened to their donkeys and their carts, especially at about one o’ clock on Friday afternoons. There was a special place over which their animals would refuse to go. Some spiritualists were consulted and they confirmed that a kramat lies buried under that spot. The Orang Cayen of 1667 were not only political exiles sent to the Company’s forest in Constantia. During company rule many political prisoners of high standing were exiled to the Cape. They were usually placed at the more remote post to prevent hem from having contact with the majority of the slaves. Many were sent to work in the forest where they later died. One of them possibly lies buried at this grave. For hundreds of years residents of Simonstown had known of the existence of two holy shrines situated just above Runciman’s Drive, there in a forest clearing above Goede gift, people from far and wide came to pay their repsects. In the early year of Simonstown, the community was a small amd concentrated one-all living within the immediate proximity of the two shrines. 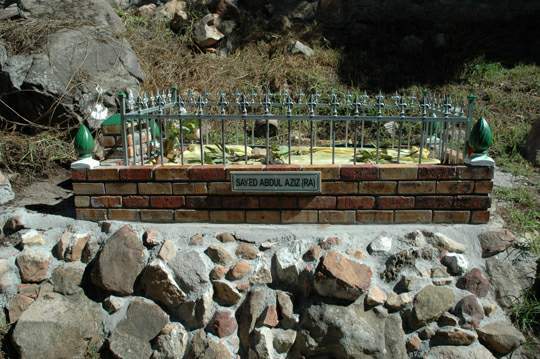 While the precise identity of these Auliyah could never be verified, regular visitors have been unanimous in their opinion that buried in these graves are indeed the “friends of Allah”. Typical of all Kramats, the area has always been enveloped in an aura of calm and tranquility. 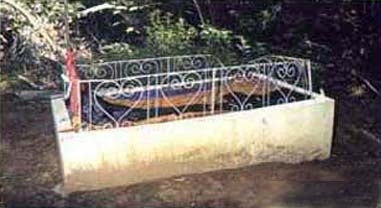 It was only earlier this century that a translation of a kitaab, passed from generation to generation, revealed with any define certainty the identity of the Auliyah buried here. Written in ancient Sumbawanese, the kitaab identifies these Auliyah as Iman Abdul Karrien bin Imam Jalil bin Imam Islam of Sumbawa in Indonesia. (aka-Tuan Ismail Dea Malela and Tuan Dea Koasa). The prescence of runaway slaves in the False Bay area early in the seventeenth century probably explains the prescence of Kramats in Muizenberg and Simonstown. The history of Wali Allah Sayed Moegsien (RA) can be traced the beginning of the 20th century to a mountain hamlet, hadratul Mout near Aden in Yamen. As denoted by the title Sayed; Sheikh Moegsien (RA) was a direct descendent of the supreme prophet Nabi Muhammed Mustafa (SAW). As a young man, Sayed Moegsien already showed great promise as an exponent of the Deen. Early in his life, he left Yamen and Emigrated to Mombassa in Kenya. 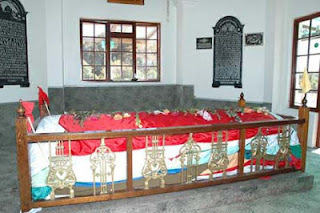 It was here that the Sheikh met Mariam, an expartriate from Hydria in India. Sayed Moegsien married Mariam and lived in Mombassa for a good few years. In 1909, Sayed finally took up the reigns of what was to be characterised as his life’s work. He actively pursued his missionary calling and departed for the Cape Town. Here he stayed for a period of ten years after which he briefly returned to Mombassa. In 1927, again journeyed to Cape Town to continue his missionary work. 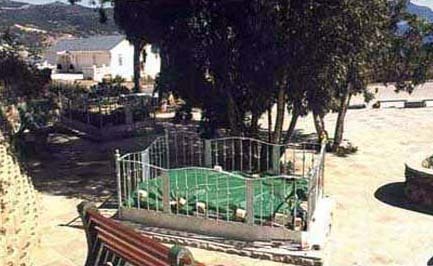 Sufi Saheb then came to Cape Town and purchased the land at Doornhoogte. 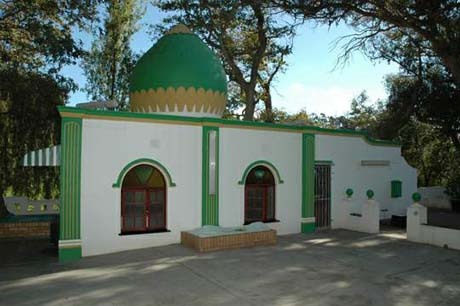 On his return to Durban, Sufi Saheb requested that Moulana Abdul Latief [proceeded to Cape Town to establish a mosque and Islamic Centre on the site he has purchased.At the there was no mosque on the Cape Flats, and on the first Friday of his arrival, he led in open air, the first Juma’ah Salaah on the Cape flats in January 1904. a year later the foundation of the Habibya Mosque was laid. This centre in the jungle soon became a great centre learning. Moulana Bdul Latief died in1917. he was buried next to the mosque which he established. This’ mosque in jungle’, large as it was at the time, was too small to accomdate all those who came to the Janazah Salaah. Although his shrine is to be found in the Habibya complex, his greatest monument is the Islamic educational and religious activities still evident in this Complex. Today it is vibrant Muslim centre, with a junior Madrasah, primary and high school, an orphanage and Islamic library. The Shrine is situated some distance from the road on “Islam Hill” in Groot Constantia and has a beauty all of its own. The need to walk up the hill fills you with a desire to pay your respects to this noble saint is his majestic court. On the 24th January 1667, the ship the polsbroek left Batavia and arrived at the Cape on the 13th of May 1668, with three prisoners in chains defeat at the at the Castle of Soeroesang in 1667. One of them was incarcerated on Robben Island, while the other two were to the Company’s forest at Constantia. Sheikh Abdurahman Matebe shan, the last of the Malaccan Sultans, was one of the two. He was regarded as Orange Cayen, a title which means ‘man of power and influence; and viewed as particularly dangerous to the interest of the Company. In 1667, and after a fierce battle. Soeroersang fell. The Sultan, Sheikh Abdurahman Matebe Shah, and his two religious advisors, were captured. His execution would have made him a matry, and thus an inspiration to his people to continue the war. The three were thus banished to the Cape becoming the first political exiles here. Oral history relates that Sheikh Abdurahman Matebe Shah, soon befriended the slave population he met at Constantia, teaching them the spot, near the river, where he took his ablutions, meditated and said his prayers. 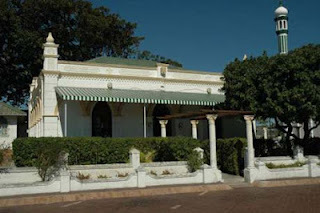 His shrine is at the gateway to Klein Constantia. Its was contained in a wooden shack quaintly situated amongst the trees, adjacent to a stream of running water. Visiting the shrine was unique experience. One felt as if one was in the living presence of history, standing in a sacred spot filled with a spiritualism. The place had a serene atmosphere, with the tranquility sweetly broken by the process some of the trees were sacrificed. A beautiful edifice, designed by one of Cape Town’s leading architects. Gawie Fagen, and constructed by The Cape Mazaar(Kramat) Society.